After I finished grad school and had to start repaying my student loans, I decided to set up a deferred payment plan where I’d pay a smaller monthly payment for a few years, and then the payments balloon later. Obviously by then, I’d be rolling in cash from my swanky library job and I’d have a dollar sign shaped pool in my backyard and wash my hair with Fiji water, so this sounded like a good idea to me at the time. However, now that I’m a month away from the increased payments, it sounds like a terrible idea and it threw me into another I’m-paying-for-a-degree-I-don’t-use-wah-wah pity party. Because as much as I want to be one of those people who gives the finger to the past and goes through life with a t-shirt emblazoned with the words NO REGRETZ, I am a person with regretz and that degree has been one of them. Usually these pity parties end when I realize that practically no one uses their degrees and it’s okay! But this time, it ended with a realization: I’m totally using my degree. I’ve always felt like I tackled food blogging differently than other food bloggers. I’m not really a writer; I’m not going to make you teary-eyed with poignant descriptions of the first time I ate a rutabaga. Blogging about myself usually makes me feel uncomfortable (in fact, I might just delete everything I’ve written up to this point and start over again right now) and while I love to cook, spending more than an hour on a single meal drives me a little bit crazy. So why do I have a food blog? Because I love problems and solutions. Eating a different diet than your friends and family can be full of problems and it’s satisfying to come up with solutions. That’s why I wanted to be a librarian too. It was satisfying to have someone ask a question and figure out an answer to it. Librarianship and blogging are very different fields, but all the classes that I took to prepare me to be a librarian have also helped me as a food blogger. Taxonomy has taught me how to organize my blog, reference has taught me how to create guides and answer questions, acquisitions has taught me how to build useful content, and management has taught me how to set goals and make plans. Being able to see this makes me feel so much better, and it makes those student loan payments a lot less painful. Well, a little less painful, at least. Speaking of problems and solutions, here’s one for you. Problem: I want to eat candy for breakfast, but I also want to be a respectable adult. Solution: Salted Caramel Granola Bars. Superlatives give me hives, so believe me when I tell you these are the best granola bars I’ve ever eaten. 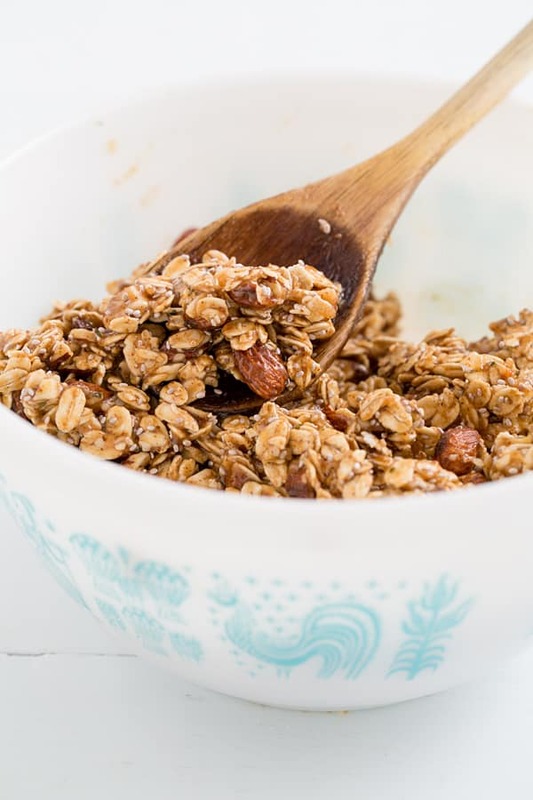 Chris and I have made and devoured several batches of Nutrition Stripped’s raw caramel and I thought I could tweak it a little bit to make it a good glue for a granola bar recipe. I reduced the amount of oil to make it stickier and took out the honey to make it vegan-friendly. These granola bars are a little bit like Payday candy bars, if Payday candy bars were made with dates and almond butter and maple syrup. They’re chewy, gooey, nutty, and packed with caramel flavor. I’ve made these with almonds, chia and hemp seeds, and I’ve also made them with raw cashews and sunflower seeds–we loved them both ways. Any nuts you have on hand will work in this recipe and if you’d like to add in chocolate chips or dried fruit, that will work too. As long as you keep the proportions the same, you will have no regretz. 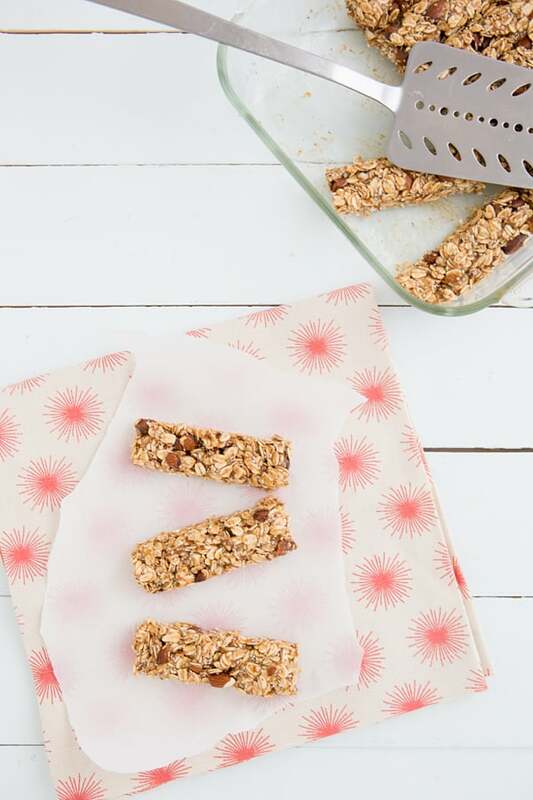 These salty-sweet granola bars might taste decadent, but they’re made with wholesome ingredients. Caramel adapted from Nutrition Stripped’s Raw Caramel with Apples. 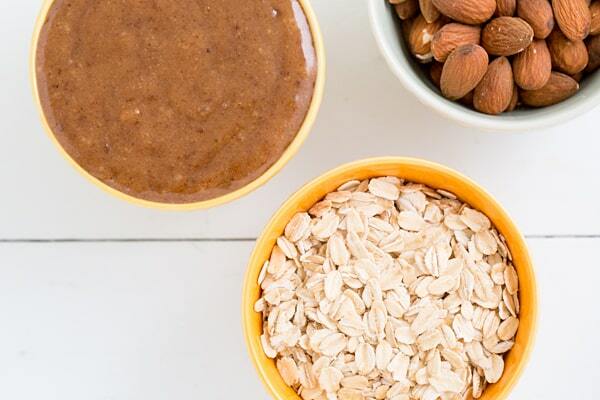 Combine the maple syrup, almond butter, coconut oil, dates, and vanilla extract in the small bowl of a food processor. Process until completely smooth; the mixture should resemble caramel when it’s finished. Stir together the remaining ingredients in a medium bowl. Pour the caramel mixture over the top and use a wooden spoon (or your hands) to combine. Grease a small square baking dish with coconut oil. Press the granola bar mixture into the dish and cover it with plastic wrap or foil. Refrigerate the granola bars for about 2 hours, or until set. Once set, cut the bars into 12 equal pieces. Store the bars in the refrigerator for up to a week or freeze them for up to 2 months. 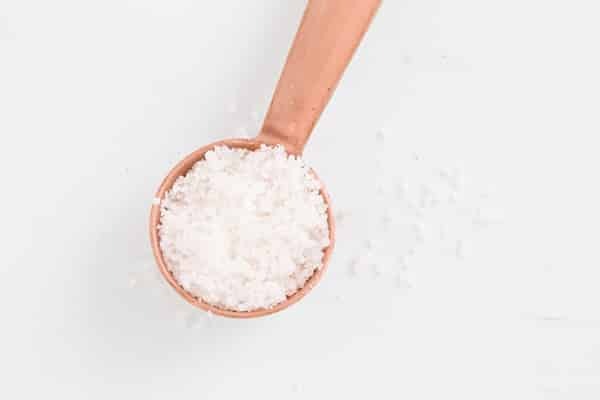 If you’re using a different type of salt, start with a smaller amount and add more to taste. Because fleur de sel flakes are larger than table salt crystals, using table salt will result in a much saltier granola bar. You can use a combination of different ingredients for the 1/4 cup of add-ins. I’ve made these with 2 tablespoons of hemp seeds and 2 tablespoons of chia seeds, and also with 1/4 cup of sunflower seeds. As long as the amount totals 1/4 cup, you’re good. Because these bars are held together with caramel, they need to be stored in the refrigerator or freezer so they don’t fall apart.